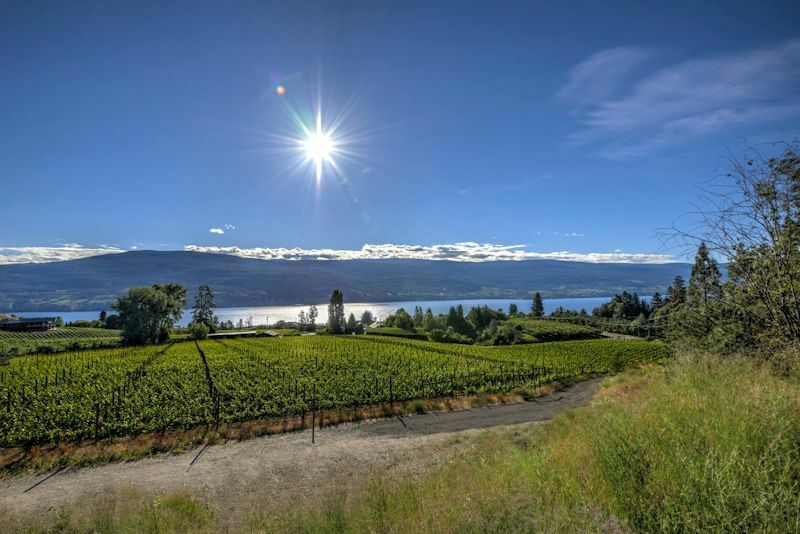 When you think of this part of the Okanagan you have to think about the contributions made by Sumac Ridge Winery and Hainle Estate Winery. Sumac Ridge was founded by Harry McWalters and Lloyd Schmidt in 1979, in 1981 they produced the first Okanagan Chardonnay. They were (1984 ) one of the first wineries to produce Icewine. It was Walter Hainle and his son Tilman who made the first icewine in the early 1970's. They produced the first commercial icewine in 1974. Today the winery has new owners using Deep Creek as the wineries principle name. Tilman Hainle currently owns the Working Horse winery. Summerland and Peachland are two small communities located along the west side of Okanagan Lake between Penticton and Kelowna. Giants Head is the key landmark of Summerland; a mountain formed by Volcanic action. New vineyards enhance the west side of Giant Head. Heading toward Peachland located 23 kilometers north of Summerland, the vineyards cling to the steep slopes running down toward the lake. This is a cool climate grape region with Pinot Noir, Chardonnay, Pinot Gris, Gewürztraminer and Pinot Blanc.